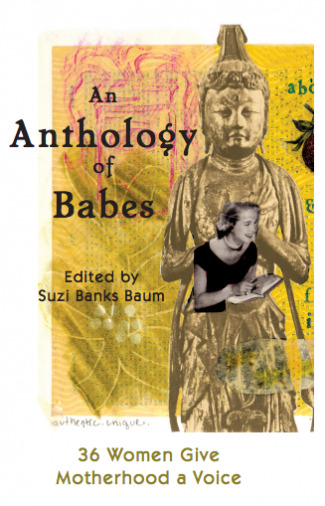 Today is the launch of Anthology of Babes: 36 Women Give Motherhood a Voice, edited by Suzi Banks Baum. 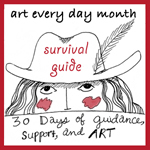 It is a collection of writings and art about mothering by women who are also artists. Do you pause during the course of a normal batshit busy day to wonder, “Will I ever finish a full sentence again?” or “Is it possible to resurrect my own voice amid the din of this crowd that persists in following me, even unto the bathroom?” These 36 women have finished a few sentences for you to be inspired by and to assure you that, yes, it is possible and even, really important for you to finish that row of knitting or write that story. In the words of Audre Lorde, “The farthest horizons of our hopes and fears are cobbled by our poems, carved from the rock experiences of our daily lives." You can read more about and purchase the book here. 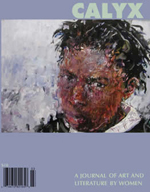 Tonight there is a celebration of the launch with new readings from mothers in the Berkshires. More details here. How exciting! I wish I could be there too. I'm honored have my writing and art included in this anthology. I can't wait to get my hands on it! Yesterday a friend of mine shared a picture of his piled books for Winter. I felt a surge of inspiration tickle my fingertips upon viewing his picture. What is it about books and Winter? What is it about gathering some of the great authors to "sit with" through the cold months? I feel as though I am a squirrel, collecting acorns and tucking them into the hole of my oak, because when my artistic soul is ready to hibernate, I want to give it something to chew on. Winter does this to me. I think back on last winter. I rose early. 5 AM. Sometimes 4:30 AM. The increasing amount of darkness that accompanies the winter was my protective blanket to push into vulnerable areas as an artist. "It's safe here," I felt the moonlight saying to me. You can read the novel Wicked and Madeline L'Engle's Walking on Water and there is time to simply ponder what secret messages they are whispering to you. You are cocooned by the warm walls of the Muse, and there is time. A white expanse of time, like the snow that makes everything look equal and tranquil. A heavy sheet of cushioning to freeze time, allowing you the luxury to sit with ideas. The teal-colored pot on the stove is simmering and soon it will boil, and I will steep my tea. "Winter is for steeping," I think. Letting the creative waters sit still, not stagnant, but still, so the chai spices can swim around a bit and then settle to the bottom, releasing a sort of golden fog stream into the stillness. There is the hustle going on somewhere outside. The rush to buy presents. The urgency to make new year's goals. The necessity of getting family all together in one place to make merry. "Can one force merry?" I wonder, sidetracked. I am introspective all the time, but all the more so in the winter. I am hibernating deep within my own skin. On the outside I carry on the traditions, but deep inside the winter tells me I am steeping for something great. I know I have another book to write. I wish it would just come out. I wish it was just a matter of showing up, because I am here in my creative space at 5 AM, sometimes 4:30 AM, every morning. 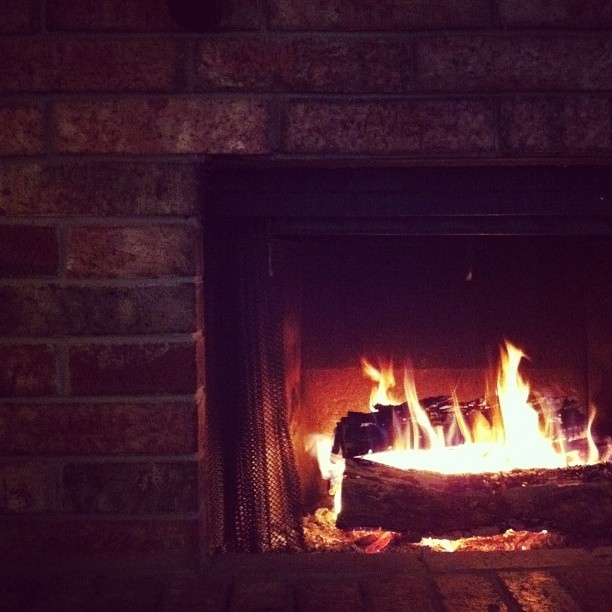 I know I am on the edge of new discoveries, of new ideas, of new ponderings, but the fireplace and my candles are lit in the Winter to remind me I am but warming up to the idea of what is next. I am watching the shifting reds of burning embers, and I think I'm doing somewhat of a red tribal dance of my own. My body is motionless on the brown leather couch with the child scribbles in ink pen on the side, but beneath the surface of stillness, I know the energy is heating up and when it's time to ignite into flames I will. The artist must trust the winter. The sitting. The dark. The frozen blanket of white. The wait. Wait and you will know when it is time, right? "Right?!" I ask with increasing anticipation. That's how it worked last winter anyway. I hibernated for a couple months, and then I ended up writing a book by February. Or was it March? Oh anyway, why would this winter be any different? But the doubts. Oh the doubts. And maybe even the pressure. Why do we put such pressure on ourselves? Isn't a joy to create? There is mysterious expectancy in this place of Winter-trust. What are you up to? One has to wonder of the Muse. And meanwhile our soul pries off acorn tops and nibbles on the nutty flesh of inspirational book piles, tucking it away in our ever-expanding cheeks, knowing (or hoping rather) one day we'll get to wash it all down with a hot mug of chai. And when that day comes, we will secretively double over in relief that the cosmos have proved we are in fact actually still an artist. One who danced in the embers at moonlight and didn't get devoured. Mandy Steward is an artist. She thinks you are one too. We are all painting on our own Messy Canvas. She invites you to be purposeful and passionate about what you are painting on yours. Mandy likes to paint with words. Word pictures that reveal the spiritual that lurks even in the mundanest of moments. But she also doesn't like to limit herself to a medium, so she explodes wherever the Muse leads. Lately that has been in the pages of her art journal. Mandy blogs at Messy Canvas. She has written four e-Books, including a free one for artists and a brand new one called Tomorrow's Dreams Today. She is also in the process of getting her first book published. I had the pleasure of collaborating with Janice of Postcards from Wildwood this month. Janice wrote the delightful story below and I created the illustration to go along with it. It fit so beautifully with the story theme, so I'm glad we were able to do it before March came to a close. Thank you, Janice for this fun experience! Enjoy the story everyone! Come, come! Over here in the bright sunshine! No, do not fear the bees. They are busy about their work, collecting pollen that will become one of the most prized of all honeys. Oh, I see you stop to admire my more extrovert companions, the delicious perfume of the purple-flowered lavender and the abundant pink and white striped blossoms of the Rosa Mundi. Of course they attract your attention; and I live constantly in their shade. My short, woody stalks and small oval leaves – even my summer cloak of tiny, lilac flowers – cannot compete in appearance. Yet – stay awhile: I am more than I seem. Allow me to introduce myself. I am Thymus Vulgaris; but since we are to be friends you may call me Common Thyme. ‘Common’, yes. I have never entirely understood that. My Latin family name Thymus proceeds from the Greek thymon, meaning ‘courage’; and for those fine people nothing could have been less common than the meaning they attributed to my ancestors. The very expression ‘to smell of thyme’ indicated high praise for a person’s stylish and elegant demeanour. Yes, indeed: I have a Greek root! I sometimes amuse myself wondering that all the thyme plants in the world must have roots reaching all the way back to Delphi. This would be bad news indeed for gardeners – except of course for those living and tending their plots alongside the great Oracle. And surely, then, thyme would have the reputation of being a dreadful pest to have in the garden – the mother of all bindweeds! And of course this is not the case. Do you see the stone plinth beside me, and sitting atop the plinth a brass sundial? – Another joke, dreamed up by one, now long gone, who used to tend this garden: Thyme flies. But all that is in the past. Today, tranquillity reigns amongst these dependable red-brick walls. Here, at any rate, Thyme has stood still. Here, thanks to my good companion marjoram and myself, all the sorrows and ills of the past are cleansed. And to me, right here, you too have been drawn so as to benefit from my healing energy. Here, take this sprig. Yes, break it off! It will bring you courage and energy. Place it beneath your pillow this evening and you will sleep the delicious restful sleep of the angels. But for now, just rest awhile. Feel your body become as one with the Earth, and breathe in deeply the scents, the beauty and the stillness that is your gift from this most delightful present. Yes, I'm curious. What's inspiring you at the moment? Are there any books or tunes or artists that are lighting your inner fire? I'm constantly adding to the list of what juices me up and I plan on sharing some of those things throughout the month. I'm super excited about and inspired by the wonderful guest posters who will be sharing stories of inspiration here throughout the month. Jen's post yesterday was fabulous! I've had a fairly quiet day today for the first time in a solid week and so I thought it'd be a great moment to share a few things that are inspiring me and ask you about your current inspiration! Nature: I'm feeling inspired by and grateful for the gorgeous weather. I took a walk down to a nearby river where I ate my lunch and wrote for an hour. It was lovely. I'm always inspired by sitting in nature and near moving water. Books: I'm currently reading: The Wishing Year: A House, A Man, My Soul A Memoir of Fulfilled Desire by Noelle Oxenhandler and absolutely loving it. Music: Somehow I missed out on the music of Arcade Fire, but the song "Wake Up" in the trailer of Where the Wild Things Are (also very inspiring, check it out below) was haunting me, so I got the album the song came from and I'm thoroughly enjoying it. Inspiration Journal: I keep a nifty inspiration journal by my bed. It's one of those thick, red, canvas-covered, blank journals you can get in book stores. I keep it to do very light, low-pressure, playful collages and doodles in whenever I feel like it. It's fun sometimes to tear through catalogs and magazines, ripping out images of whatever catches my eye. I glue them in in a pleasing fashion and sometimes write words alongside them. Looking back through it today, it felt like I had been writing a visual love letter to our first home. Sadie helped me flip to this page today. I like all the muted colors and textures here. Interview: I loved this video interview of Dirty Footprints Studio's Connie on Darrah's blog, artcetera. Connie is too cute! I loved when she said, searching for your artistic voice is like searching for your own nose, it's already there, you don't need to find it!! Ok, she said it better than that, so go over and listen for yourself. And if you'd like to hear more of Connie (and me! ), tune into Connie's blogtalk radio show this Sunday, September 6th at 6pm EST when she'll be interviewing Jennifer Lee and I about our Creative Play workshop in Boston this month and lots of ways to add creative play to your everyday life. You can even call in and say hello! Writing: I love Eileen's writing. This post about the times between our creative pushing and the meanings behind our obsession with Buffy (or whatever it is you're obsessed with) is saying about you, is a great example! Podcasts: I love to listen to podcasts, so I'm super excited that the fabulous Jamie Ridler has started her own all about creative living! Check out her very first podcast here. And the list could go on and on and on...But for now, I bid you adieu. p.s. Please send some good kitty vibes to my kitty Sadie who is having an itty bitty lump removed tomorrow. Thank you!! Self-doubt is something that plagues most creative souls at one time or another. We may be going along, feeling great about our creations, and then something happens that shakes our confidence. Perhaps we get a rejection to a show or someone makes a nasty comment about our work. Perhaps we compare our work to someone else's or our inner critic gets really loud. Or perhaps self-doubt just sneaks up on you out of nowhere, whispers in your ear, and suddenly you'd rather do anything, but make art. Self-doubt feels awful, but it comes up, so how do we move through it and return to our creativity? Be Gentle: Don't beat yourself up over your self-doubt. It's easy to go there, to think, "Ugh! Get over it already. Stop procrastinating and just do it. Sheesh!" Yelling at yourself may work in the short term, but it usually turns into a viscious cycle of beating yourself up, avoidance, more beating yourself up, followed by procrastination, some more beating yourself up, with a kicker of feeling like dirt. No fun. Instead of going to your drill sargeant voice, try going to your gentle mother voice. Try telling yourself something like, "Hey, it's o.k. that you're doubting yourself right now. It happens. I know you're wonderful. What small step could you take to feel a bit better?" Keep a Kindness Folder: Sometimes we need to be reminded how fabulous we are. Try keeping an appreciation folder (I keep a folder in my email for just this purpose) where you can collect kind emails, letters, notes, tweets, etc. When you begin to doubt yourself, go to your folder, read a few of the notes you've saved, and soak up the love. Write a letter to yourself: Feeling appreciation and love from others is wonderful, but we are also capable of giving ourselves love and appreciation. I've found it's helpful if you can write to yourself (maybe your artist self) from your wiser self. You'll find your kind, wise self will know just what to say to lift you up. Begin with Baby Steps: I mentioned this briefly in the first step, but it's so important that I had to make it its own step. One of the best remedies for self-doubt is action. I prefer to begin with gentle action, action that is full of kindness and permission and playfulness. And the best way to move into action when you're in self-doubt mode is to start small. Start with a doodle on an piece of junk mail, write a silly haiku, dance around your living room, sing in the shower, or play with crayons. Let go of the need to make a masterpiece and for now, for this moment, start with something that brings you delight, one teeny tiny thing. Remind yourself of your accomplishments: It's easy to forget all that we have already accomplished. Take some time to make a list of how much you're already achieved. Looking back over old diary entries can sometimes help remind me how far I've come. On a smaller scale, you can keep an "already done" list each day to keep track of all the things you've done instead of focusing on what you didn't do. Keep taking risks: It's amazing to me how despite our self-doubts, we keep putting ourselves out there. And I want to simply encourage you to keep taking those risks, big and small, in your life and in your art. Taking risks helps squash those pesky self-doubts in a powerful way. Your risks may be trying out a new color, learning a new style, reaching out to a fellow artist, submitting your work to a show, posting your work online, or opening up a shop. Not all our risks will have the results we want, but every risk gives us the inner knowing that we are capable of more than we realize. 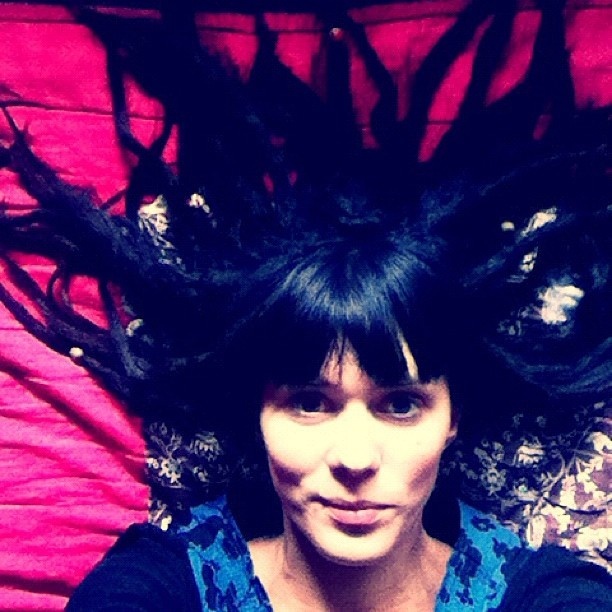 Awhile back, I wrote about celebrating your creativity. Celebrating in general is something that can be challenging for many of us, myself included. For me, when I finish something, I tend to move quickly on to the next without taking the time to celebrate, but it's something I'm working on because I believe good self-care includes celebrating the good stuff, big and small, in our lives. And as it's the month of self for the Creative Every Day Challenge, I thought it was the perfect opportunity to talk about celebrating yourself! Today happens to be my birthday. I've always felt like my b-day is a day to do something special for myself like taking the day off to get a massage, go to a movie by myself, get taken out to my favorite restaurant, or plan a mini-trip. But you don't need to wait til your birthday to celebrate yourself. One of the simplest ways I've found to celebrate is to think about what brings me delight. Take a moment and write down 25 - 50 (or more!) things that delight you. How can you bring more of these things into your everyday life? What things can you schedule in this week or this month? Some things that bring me joy are: snuggling my kitties, reading good books, wandering aimlessly in a bookstore or library, laughing with the hubster, sitting by a body of water, doodling in my sketchbook, and silly socks. As much as I love enjoying my birthday, I sometimes get a little shy when receiving gifts or compliments. But it's so good to be open to receiving love from others and from yourself. Do you ever disount someone's compliment? I used to do it all the time. Someone would say something like, "Oh, your hair looks great today!" and I'd say, "Oh, thanks, it's kinda frizzy." It makes others feel good to shower you with love, so try allowing yourself to drink it in without trying to squash it. Try simply saying, "Thank you." How can you celebrate the wondrous person you are? If you're a bit reluctant to celebrate yourself, start small. What's one small thing you adore about yourself? Keep adding to the list. Foot rub: Treat yourself to some yummy scented lotion and rub your feet. Shower Power: Spend some extra time in the shower or the bath with some scented shower gel or bath salts. Warm water feels fabulous and taking some time to take excellent care of your body is so important. Good Grub: Making yourself a great meal is a wonderful way to treat yourself. Even something as simple as a slice of lemon in your water can feel fabulous. Flowers: Simple, yes, but a small vase of flowers can give you such a great lift. Bring some beauty into your space and delight in it. You're totally worth it. Let Go: Let go of something that you've been holding onto that you just don't love and don't use. It feels great to let go of stuff that doesn't bring you delight. Create: Write, paint, draw, get creative. Express yourself freely, just for fun, for no other reason than because you love it. What are your favorite ways to celebrate yourself? Tonight is the Full Buck Moon and I celebrated in my favorite way by painting the moon, one of my favorite subjects. I have a couple new moon related pieces up in my art shop, including the one above, If the Moon Came to Dinner. Jamie's group does the Dreamboards in a collage style, which I totally love. But I've also been enjoying doing painted versions of these dreamboards lately. Above is what I did for the Full Pink Moon last month. As I pondered the Full Buck Moon this month, I started to doodle in my sketchbook and drew a woman with antlers. From the circles hanging from her antler prongs I drew circles containing the things I wanted to bring forth. I took the little sketch I made yesterday and made the mixed media piece above in my art journal. The hubster fell in love with it before I finished it with the words in the circles, so I'll be handing it over to him. To finish the process, I did a second one in my art journal (below), this time writing in the words of things I want to bring into my life, expand upon, create, and grow during this full moon cycle. Do a collage version: Tear through magazines and pull out any image that catches your eye. Don't think about it, just go with your gut. After you've pulled a pile, look at your selections and place the images that really sing to you on a piece of paper. Arrange to your liking, glue down, and then hang your dreamboard somewhere you can see it daily. Write it out: Sit quietly, breathe, and ponder what you'd like to bring into your life. Then pick up a pen and do 20 minutes of free writing. You could describe your ideal day as if all the things you're desiring are already in place or just write freely about all the things you're wanting to draw to you. Mixed-media: If you do the collage version, you could take the collage you create and paint over it, letting some of it show through. You could paint additional images on top of your collaged dreamboard. You might add writing to the collage. You could collage your own painted, drawn, or hand written elements into the piece. You might simply put some writing in an envelope and attach it to your collage. Or you could create mini envelopes in the collage to place one word, such as "money", "health", or "inspiration." Paint: With the ideas of what you want to draw to you held loosely in mind, allow yourself to paint intuitively. Let yourself go with whatever colors or images pop into your head without worry about what it means. Keep painting until you come to a natural stopping point, then step back, and see what has come up for you. Put your painted dreamboard somewhere where it can continue to inspire you throughout the month. Make a book: Create a small book or keep a blank journal where you can paste, draw, and/or paint images of things you want to draw into your life. I keep something like this by my bed and enjoy tearing images from catalogues and magazines and pasting them in. It's very relaxing. Make a box: Collage a box as your dreamboard with images and words. Use it to hold collage material or written bits to put in future dreamboards or art journal pages. Have you ever used any of these ideas? What other ways can you play with the dreamboard idea? What is that you want to bring into your life during this full moon cycle? JimDoran Jazz, Pirates of the Caribbean. obrown Sometime (usu) silence, occasionally mindless television, rarely music. Great question! acrawley Tho' sometimes I do like to create in silence. TouchSoul Silence when I draw; Music when I color. News when I clean. ERLong8502 Silence usually, occasionally instrumental music. People talking/singing tend to interrupt my flow & scatter my focus. OoffAhh Nothing helps the creative process like Philip Glass! HiroBoga Silence when I'm writing. Music when I'm creating book covers or drawing or cooking. What do you listen to when you create? Is your art impacted by what you listen to? Today or tomorrow (depending on where you are in the world) marks the start of the Full Flower Moon (also known as the Full Planting Moon or the Milk Moon.) When I thought of the Creative Every Day Challenge's theme of Nature this month, one of the first things that sprang to mind was the moon. and decided to take a dip. which caused the waves to ripple and dance. like a refridgerator late at night. Perhaps the glorious full moon will inspire some art in you this weekend, perhaps a poem will spring forth. The moon is also a constant reminder of the cycles of life which are much like the cycles of creativity. I spoke about these cycles with Jamie for the Your Creative Spark interview and I also wrote about them a bit here and here. It's important to remember that our creativity ebbs and flows and it's perfectly o.k. to experience downtimes. If we ride them like the waves, the whole experience is so much more smooth than if we fight them. You could also play with the full moon by creating a Full Moon Dreamboard, which Jamie Ridler leads us through every month. These are similar to vision boards, but the idea is to create the vision of what you hope to bring into your life with each full moon. I painted a dreamboard for myself for the Full Pink Moon last month and it was a lovely experience. Try this: When you reflect on the Full Flower Moon, what does it inspire in you? Perhaps some blossoming or blooming that is wanting to take place? Write, doodle, sketch, or paint whatever comes up. I hope your weekend is full of inspiration and creativity and fun! In the meantime, go howl at the moon! Yay! 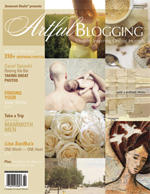 I'm so thrilled to say that I've got two articles in the the Summer edition of Artful Blogging Magazine which is available online or stores like your local Barnes & Noble today. Since I first saw this publication, I hoped to someday be featured in their pages. It's simply gorgeous, full of color and inspiration and loads of great blogs to check out. And now, here it is. So wonderful to see a goal materialize. 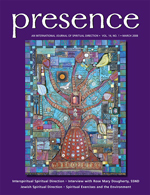 You can see one of my paintings (Dreaming of the Seven Sisters) in the lower right corner of the cover. 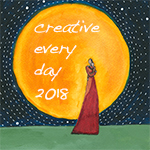 The first article consist of an article from me about being Creative Every Day, illustrated with my art along with a partial blog post and the second is an interview with me about the Creative Every Day Challenge, illustrated with the art of Creative Every Day Challenge participants! Here are the first two spreads of my article. The artists featured are Steve Emery, Rowena Murillo, Jim Doran, Tammy Vitale, Erin Prais-Hintz, Mary Stebbins Taitt, Karen Mowrey, and Shayla Perreault Newcomb. And there are also quotes from Emily Carson, Sherry Goodloe, and Aurora Fox! Thank you to all of you for sharing your art and words to help make my interview with Artful Blogging so special!! It means the world to me and wowzers, your work looks amazing on the glossy pages! I wish we could have featured all the CED participants, but that would take an encyclopedia! And thank you to all the readers of this blog and all the participants of Creative Every Day for making this space so safe and so special. You all inspire me and have helped me grow as a person and an artist. I am eternally grateful. Wishing you a wonderfully creative weekend! p.s. We have entered the month of May and the totally optional theme is Nature! I've got lots of ideas about how to explore this theme and I look forward to seeing what you'll do with it! p.p.s. Be sure to join in Jamie's Virtual Dance party today! !